I saw those princesses too, Jim, and had the same thought about custom fodder. Let's keep our fingers crossed. Sorry.. just a bit excited by this news.. I totally thought they would follow the Superfriends line with Stewart instead of Jordan.. very excited! In Brightest Day or Gotham Knights.. Right click on the x and hit "view image". Did that work? Hey Jim, was this an actual Imaginext Princess Castle or is it a different brand? I would love to find a set that could merge the fun for boys and girls. When our neices come over they feel a little left out with all the superhero stuff in our toy room. 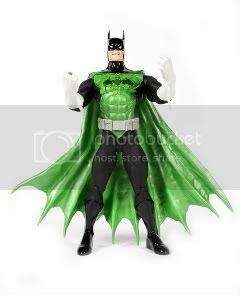 Hey Bat Lantern, the line for girls isn't called Imaginext. It's called Precious Places. But it IS made just like Imaginext. As mentioned earlier it even uses the same base bodies for the male characters. It also has the same price point structure Imaginext has. Small carded sets are around $6 all the way up to $50 or so for the Princess Castle. So yes it would be perfect for the nieces to play along with the Superhero or Dragon Imaginext. Post subject: any new finds? anything new on the imaginext front? i havent found anything new lately, has anyone else? I took the plunge a couple of weeks ago and picked up the Superman single (with Krypto!). Yesterday I went to TRU and picked up the TRU Batcopter that comes with Batman, Robin and that little bubble vehicle, the TRU Joker's Van and the Batmobile that drives when you turn the "key." They have all of their Imaginext on sale this week for buy 2, get one free. I almost got the BatCave, but went with the TRU vehicles since you can find the Bat Cave at other stores. Has anyone noticed the new Imaginext commercials? Grand fun in the old school tradition. Unfortunately the commercial only features the Batcave and related accessories plus the Joker single, but, Hey, it's still a nice little thing to see on tv. My son gets a kick out of it saying "I've already got that" every time he sees it. The TRU sale is nice for those looking to get caught up. I picked up the newer large vehicles (Deluxe Batcopter, Joker Van, and Bat Jungle Tracker) for a tidy little discount, plus a Birthday Gift Cert. for my son, plus a coupon I had lying around... and then I got the points on the reward card. All in all, not too shabby.